War: What Is It Good For? Where Is God In Times Of Terror? After Jesus ascended into heaven, His followers were tasked with spreading the good news of salvation "in Jerusalem, and in all Judea and Samaria, and to the end of the earth" (Acts 1:8). The book of Acts details the early church's rapid growth as they received the Holy Spirit and carried out the Great Commission to a world that was hungry for it. 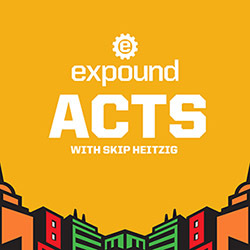 In this verse-by-verse study, Skip Heitzig teaches how we can be effective witnesses for Jesus Christ in the world today, and we learn how God continues His work through the Spirit-empowered church. Welcome to Expound, a verse-by-verse study of God's word. Our goal is to expand your knowledge of the truth of God by explaining the word of God in a way that is interactive, enjoyable, and congregational. Father, we thank you for the word of God that does the work of God in the hearts of the people of God by the Holy Spirit of God. Father, we are here asking you, as the good physician, the great physician, to do surgery on our hearts, to work in our lives, to remind us of truths long forgotten, unknown perhaps by some, that need to be reaffirmed tonight in this place to us. As we consider, Lord, prepare our hearts as we share together at your table in Jesus' name. Amen. Well, you'll remember from last time that we discovered that God has some incredible mathematics, that at first the Lord added to the church daily those who should be saved, acts chapter 2 verse 47. The Lord was adding. Then as we continued to read through this book, we saw multitudes coming. So we saw that the Lord not only adds, but he multiplies, that his work was spreading so rapidly that there were multitudes of people in the early church that was at one time only 120 people. So the Lord adds. The Lord multiplies. But then last week, we discovered the Lord is also sometimes in the business of subtracting. Anaias and Sapphira were eliminated from the church. They were subtracted from the church by the Lord. So the Lord adds. The Lord multiplies. The Lord subtracts. One thing he never does in his math, he never divides. That's the devil's work. And he employs people to do it, but we're going to see division here in this chapter. And then we'll see how the Lord corrects that through his church and then continues to add and continues to multiply. But we're in Acts chapter 6, and we have a very interesting case of church life and church leadership. I love church leaders, but I know that no church leader is perfect. You know that too. No church is perfect. But I heard a story about four leaders of a particular denomination. They all went together to a conference of some kind, a leadership summit. And while they were there, the emphasis at this conference was on being real with each other, baring our souls, confessing our sins, being honest, getting to know one another. So at a coffee break, these four leaders over coffee started talking at a deeper level. And the first one said, brothers, I just need to tell you that I have a particular thing I struggle with. Even though I am a leader in a church, I struggle with drinking. I know I shouldn't do it. My congregation would be shocked if they found out. I even preach against it. But every now and then, I just feel like I need a sip. And they were giving him their ear and they were trying to sympathize with him. And the second guy said, well, brothers, I need to tell you that I have a problem with gambling. Whenever I travel, I have a strong temptation, and I have lost a lot of money in gambling situations. The third one hung his head and he said, I have a struggle with my income tax, being honest at the end of the year and reporting what I brought in and fudging with the numbers because though I know we should pay our taxes to the government, I also struggle with my finances. And I could use a little extra money. And so I've cheated on my income tax. The fourth guy in that little circle of leaders was strangely silent the entire time. And so all three of them afterwards looked at him. And he said, well, guys, I've never been attracted by alcohol. I don't struggle with that, never have. Gambling is not appealing to me whatsoever. I pay all my income taxes. But I do have a vice. My big vice, my big problem, is gossip. And I just got to tell you, I can't wait until this conference is over so I can tell everyone about you guys. Ouch. Nobody's perfect. No church is perfect. No leader is perfect. There's only a perfect God with a perfect son who gives perfect salvation to imperfect people, and that's us. And we discover that truth here in this chapter. And let me just say, I am very thankful for the book of Acts. I'm thankful that we have a record, an honest record, of the earliest weeks, months, and years of church history and how it unfolds. And the reason I say I am thankful is that it doesn't pull any punches. It doesn't gloss over any personalities. It tells you straight up who these people were, where they excelled, and where they failed. For example, we have already read about the suicide of one of the apostles. Judas killed himself. That is honestly portrayed in this book. We have already discovered the elimination by God, the judgment of God, on a couple, a notable couple in the early church, Ananias and Sapphira, his wife. Later on, we're going to read about two leaders, Paul and Barnabas in chapter 15, getting into such an argument that they have to split company and go in two entirely different directions. So it's a very honest rendering. Now we have another problem here. The problem is a complaint of one group against another group. And the complaint brings dissension, brings division in the church. As I mentioned earlier on, division is seen in this chapter. I've told you before that little truth, that whenever you turn the lights on, the bugs come. And whenever the light of the gospel shines brightly, Satan will send his bugs, and you'll get bugged. He'll make sure that you do. And if you are preaching the gospel, teaching the word, raising up leaders-- you have a vision for another country-- you're going to get attacked. It comes with the territory. So far, we have watched Satan attack the church, first of all by persecution. He's always done that. He's done it since day one. He did it in Jerusalem. A law was passed that it's illegal to preach the gospel. Peter and John didn't seem to care. They just said, you know, you're going to have to figure out if it's OK to do that. We're going to obey God, not you. And they kept doing it. They got arrested. Angel sprung him out of jail. They went back and did it again. But persecution against the church was the first tool Satan employed. It didn't work. It didn't work. In fact, it backfired. It grew more. It went from addition to multiplication. So he tried another tactic-- corruption, hypocrisy, Ananias and Sapphira lying to the Holy Spirit, in effect lying to God. That didn't work. God eliminated them, purified the church, and the church grew, as we saw last time. It was the end of that story. But now he employs another tactic. The Bible says, we are not ignorant of his devices. He will always employ one of these devices. And here we see that division, that dissension in the early church. Whenever there is a church that is complaining, backbiting, quarreling, disagreeing, arguing, one group against another group, the message that they preach is so watered down it is ineffective. The world can't hear it. The church needs to be purified, cleansed of that. And we'll see how the Lord does that in chapter 6 through organizing by the early church leadership. Now, I know we haven't even started yet. But again, there's only 15 verses, so stay calm. I mentioned organization. I just want to say a word about that here because the problem that existed in the early church of chapter 6 was fixed by the Holy Spirit leading the leaders to organize the church in a different format so as to solve the problem. Why is that important? It's important because sometimes, people think that organization is bad. I don't believe in organized religion. I'm suspicious at organized religion. I hear that term, and I hear it in a scornful way-- an organized religion, ooh, that's bad-- as if to imply they would rather have disorganized religion. But some would. Some think that if you organize anything the Holy Spirit is doing, it's wrong. It's of man. It's evil. But as I read my Bible, I discover my God is a very organized God. And he says, let everything be done decently and in order, in an organized fashion. And the more people you have, the more organization is necessary. The church is both an organism and an organization. Now, an organism is something that is life and life-giving. It's living, moving, expanding. But unless you organize an organism, you have a problem. You could have a cancer, or you could have just a blob. So the organism must be organized. And God is organized. That's why we have sunrise and sunset every day, or the revolution of the Earth around the Sun, to be more precise. But we call it a sunrise and a sunset. And we can program that. We know exactly when it's going to happen tomorrow and when it's going to happen in a month because we have observed an orderly, organized universe. On the other hand, you can organize things too much as if to say, well, Holy Spirit, we're going to form our structure, and we expect you to just sort of follow what we've organized. Now, what do you do with organization is the only time you need to change the organization is if there is a need or a demand that the organization will solve the problems within. And we're going to see what the problems are. The first is growth. So in those days, verse 1, "when the number of the disciples was multiplying"-- please note that-- "there arose a complaint against the Hebrews by the Hellenists because their widows were neglected in the daily distribution. Then the 12 summoned the multitude of the disciples and said, it is not desirable that we should leave the word of God and serve tables." The church at one time had 120 people in an upper room. Life was grand. It was awesome. It was simple. They waited on the Holy Spirit. He moved. It was just, let's see what the Lord's going to do next. The problem came when it started growing. Now, I know. I've heard it a lot over the years. Well, that's a good problem to have. I remember hearing that when our church at first started growing and growing and growing. People said, man, wish we had those problems. That's a good problem to have. It's a good problem, but it's still a problem. It still needs to be addressed. And I can recall back when the church was growing so fast, so large. There were so many people that we were finding ourselves not ready. We didn't prepare any infrastructure or organization yet. We were just reacting to the growth. So the number of the disciples that says we're multiplying. Part of the problem that is created when the group gets larger and larger, I can think of a couple complications. Number one, there is a perceived-- and I underline that word-- perceived lack of concern. Oh, it's so big. They don't care about me anymore. That's just-- it's going to happen. People are going to automatically think that large means not able to touch the individual, impersonal. There's a perceived lack of concern. And another problem is there's an expectation that comes along with this that, well, you're a leader. You've got to personally fix this. You yourself have to be the one pastor to fix this. And I love this story because the disciples fix the problem. They address it head on, but they're really not going to be the ones fixing. They're just going to be the ones ratifying, going, amen. I like that. Good idea. Good choice. But there's a perceived lack of concern, and there are expectations that come with it. I can hear some of the original 120 members of that upper room congregation murmuring to each other, it's not like it used to be. Unless I get there early, somebody takes my seat. I like the orange carpet better. Who likes orange carpet? Who knows. All sorts of complaints going around, but this is one in particular we're told in verse 1. There arose a complaint, a murmuring, against the Hebrews by the Hellenists because their widows were neglected in the daily distribution. So there's internal conflict. And it's one group of women against another group of women. It's in the women's ministry. No, I'm not impugning. I'm not indicting. I'm just noting that in the early church, this was the case. One group were arguing against another group. "Then the 12 summoned the multitude of the disciples." Now notice the word "disciples." It's the very first time the word is used in the book of Acts. It's used a couple hundred times in Matthew, Mark, Luke, and John. It's used 28 times in the book of Acts. It's used for the first time here. Organization at the very beginning was very simple. There were apostles, and there were disciples. Now, back in the gospels, the disciples that followed Jesus, there were lots of them. But Jesus chose 12 of them to become his apostles. You remember those stories. But the organization in the nascent part of the church, there were disciples, which means learners, students, and there were apostles designated as sent-out individuals. So there were the apostles, the 11. Judas was gone. One was added. So you really have a book of Twelve Apostles, and you have a group of disciples. So this is the first time it is mentioned. It won't be the last time. You'll read about it again and again. But notice that they were complaining because the widows were neglected in the daily distribution. It seems that in addressing the poor in the church, the poverty that was existing in the early church at Jerusalem that we described reasons about last time-- so many of the jobs were temple-related. Many of those early messianic believers lost their employment. So to address the issue of poverty, the early church would give out a daily food distribution. Well, one group thought another group was getting more than they were. The Hellenists-- I'll describe them in a moment-- thought the Hebrews-- I'll describe them in a moment-- were getting the better end of the stick. They, the Hellenists, were getting less. Now, there were two types of Jews back then in Jerusalem. There were what's called the Hebrews. These were Aramaic-speaking local Jewish men and women. They read the Hebrew scriptures. They spoke some Hebrew in the liturgy of their worship, but they spoke daily Aramaic, the language of Jesus, the language of the Near East at that time. They held tightly to no translation, just the original Hebrew scriptures. But there was another group called the Hellenists. They were primarily Greek-speaking Jews of a group known as the diaspora. Have you heard of the diaspora? It means the dispersion. The Jews that had been scattered all over the world, that's the diaspora. If you're not living in Israel, you were part of the diaspora. You had been scattered elsewhere. So many of these scattered Jews stayed scattered. Many of them came back to Jerusalem. When they came back to Jerusalem, they congregated with people like themselves. They spoke Greek. They had a Greek background, background of different cultures. And they congregated together. They had their own synagogues. The Hebrew had their own synagogues. The Hellenists had their own special synagogues. They didn't read from the Hebrew scriptures of the Old Testament, but from the Greek translation called the Septuagint version. That was their version. Well, you can just see that there's going to be a conflict because the Hebrews speaking in Hebrew-inclined local Jerusalemite Jews always felt that they were a cut above those who were the Greek-speaking, worldly, from other places Jewish people. So there was always this tension. They had their own synagogue so they could worship separately. But now they're called together in one church, one fellowship. Both messianic Jews, both believers in Jesus, but both very different backgrounds, now they're put into one church. And whenever you have different people in one group, you're going to have problems. And they had problems-- a perceived lack of concern and an expectation that the apostles need to fix this problem. So the 12 summoned the multitude and said, it is not desirable that we, we the apostles, should leave the word of God-- that is teaching the scriptures. That's what we're called to do. The Apostles' doctrine, Acts 2:42, they were big on that. That was first on their four-tiered list. We don't want to leave the word of God and serve tables. Now, the tables need to be served. The apostles recognized the problem. They're meeting it head on, but they're just saying, we're not going to be the ones to do that personally. Therefore, verse 3, "seek out from among you seven men of good reputation full of the Holy Spirit in wisdom whom we may appoint over this business." Now, before I get into that part, let me just for a moment concede that there really was a problem of a lack of concern. Let's just imagine there was. We don't know that there was. We just know one group said there was, right? They made a complaint. But let's just say there was a problem and the Hebrew-speaking Jewish widows were getting preferential treatment and the Hellenists were being short-changed. Let's say that was a problem. If that was a problem, the problem was made much worse by the complaining about the problem. Can you agree on that part? You may have a problem. And OK, we understand there's a problem, but we're going to try to fix it. But it's not fixed yet. And so you start talking about it to other people. You start spreading bad seed, bad words, bad ideas, and inferior motives that may not be there around. And you know what? Did you know that God hates that? I don't mean he just doesn't like it. He outright hates that. In the Book of Proverbs chapter 6, there's a list of seven things God hates. Don't do it now, but I commend, sometime, go look at Proverbs 6 and look at, even memorize, the seven things that God hates. It says six things the Lord hates, yea seven, are an abomination to him. And last on the list, he who sows discord among the brethren. God hates that. So there may have been a problem. They made the problem worse by murmuring. And the word "murmuring" or "complaining" is a very interesting Greek word, [GREEK]. See, you laugh at that because that word is an onomatopoetic word. That is, the word sounds like what the action was. It sounds like you're complaining, [GREEK]. So they spread that bad seed around the church. So here's the solution. "Seek out from among you seven men of good reputation full of the Holy Spirit and wisdom whom we may appoint over this business." You do the finding. We'll do the ratifying. You select them. We'll say yes to it. Problem needs to be fixed. Go fix it. Bring the solution. Bring the people to us that we may appoint over this business, but we-- here's their priority. "But we will give ourselves continually to prayer and to the ministry of the word." I smile when I read this because I'm so proud of these apostles, I want to go in the room and pat Peter on the back and grab John and go, man, you guys have grown so much. And if I would've done that, they'd look at me and go, first of all, who are you and what are you doing in our story? And second, what do you mean we've grown so much? And I would say, well, guys, do you remember back when Jesus was feeding the 5,000 or wanting to, and all you could say is, send the multitudes away, that they may get food in the villages around here? Remember that? That was your solution, send everybody away. And do you remember when that Canaanite woman brought her little daughter who was demon-possessed, and the apostle said, send her away? She's crying after us. Boy, they've grown a lot. Can you imagine the early church coming to these apostles and saying, we need help, man. One group is getting preferential treatment, and the apostle saying, go away. Find your own food. But they've grown. Now they're facing the problem head on, and they're coming up with a good solution to it-- not send them away, let's fix this issue. Let's get people who can fix this issue. Now, here was their problem back in the gospels in those two stories I brought up. When they said, send the multitudes away because we don't have enough food for them, the problem the disciples, the apostles, had back then is they saw themselves as manufacturers rather than as distributors. They thought, well, we have to come up with this food thing. We don't have enough food. Send them away. Jesus wasn't asking them to come up with food on their own, just to distribute what he was going to manufacture. So they should have just said, ah, OK. I don't know what you have up your sleeve, but we're here to serve whatever you say. But they saw themselves as the ones responsible when they weren't doing anything. Jesus was doing all the work. They just had to distribute it. Now they get it. Now they see themselves as distributing whatever provision the Lord has brought into their hands. And so they set their priorities. We're not going to leave the word of God and serve tables. We want to give ourselves continually, verse 4, to prayer and to the ministry of the word. I love their priority. We're not going to leave the word of God and serve tables. I'm going to speak candidly to you. Over the years, I have seen many a church leave the word of God and serve tables, starting out as a Bible-teaching church, after a while, saying, you know, people don't really want to hear Bible-teaching. They don't really want to hear deep Bible study. They don't care about Greek words and Hebrew words and syntax and context and history. They just want to have a pep rally. So I'm going to change-- let us change as a church and start preaching a social gospel and having pep rallies instead of giving the meat. They set their priorities. We're not going to leave the word of God and serve tables. We're going to give ourselves continually to prayer and the ministry of the word, those two priorities. Churches, I have seen, leave the word of God. I've seen pastors leave the word of God. And it's easy to do. Here's why. It's not easy to study all day and teach. It's not all day to pour hour after hour into the text and get the bearing of the text and the meaning of the text to make it plain and understandable. It takes a lot of work. And I remember J Vernon McGee, when I asked him-- I've told you this before. I said, why don't more pastors actually teach the Bible? And he just said, because they're lazy. And it's easy to get lazy, and it's easy to get distracted. There are so many things that get involved in the church. So when we first started this fellowship, I did it all. I led the worship along with Laura and a few others. I kept the books for the corporation. I did the counseling. I did studying for Bible studies and was newly married and had a full-time job. Something had to give. And as the organization grew larger and larger, more had to give, and more had to give, and more had to give. And you just have to specialize. But one thing you can never give up as a pastor, at least, the word, the word, the word. Preach the word, Timothy. The instant, in season and out of season. That was their priority. I had a homiletics professor, Dr. Nat van Cleave, who said to us one evening in our class. He said, if you preach for one hour or teach for one hour to a group of 100 people and you are ill prepared to do so, you've just wasted 100 hours of God's time. As you can see, I've never forgot that. That stuck with me. It's like ugh, arrow to the heart. OK, ugh, pull it out. Make that a priority. So that was the stake they placed in the ground. So did you notice the qualifications in verse 3? I know I'm moving slowly. First of all, seven men. Why seven? I don't know why except-- well, it's the number of completion and perfection. No, there's a more fundamental answer than that. It seems that the early church, when it came to organizing things, because they didn't know what to model their organizational structure on, they were organizing the early church based upon the model they saw in Judaism. In Judaism, in any community, all of the public affairs were done by a group of seven elders. Seven men were selected from the town, from the community, who had integrity and were notable and noteworthy. And they were in charge of gathering together and settling disputes and settling issues within the community. So it seems that they were simply modeling what they knew in Judaism. I can't be sure because we're not told, but that seems to be what they were doing. But notice, "seven men from among you." Don't go outside and hire people you don't know who have a good resume. Get somebody from your own church who has been with you. They understand the philosophy of ministry. They're part of the fellowship. They get it. And "full of good reputation," so they have to have been there a while. They have to have been able to be observed, to be watched, to be involved in some capacity. And as others watched them, they developed a reputation, and in this case, a good reputation. Notice next on the list, "full of the Holy Spirit"-- you know, you can have all the other previous qualifications. If you don't have this one, it's worthless-- filled, controlled by, managed by the Holy Spirit, a person who's spirit-led. And wisdom, you know what wisdom is. You can be smart and not wise. You can have a high IQ. You can have a degree. You can have several degrees. You can have a PhD degree, but God will give you the third degree if you're not wise because knowledge is one thing. Wisdom is the right application of that knowledge. So all of that is observable. They're wise in their transaction and decisions. "Whom we, the apostles, may appoint over this business," you select them. We'll appoint them. We will give ourselves, verse 4, continually, over and over again as a priority, to prayer and the ministry of the word. And get this-- the saying, please the whole multitude, that's unusual. And they chose Stephen, a man full of faith and the Holy Spirit. You'll read more about Stephen in the next chapter. And Philip, you'll read more about Philip in the chapter after that. Prochorus, Nicanor, Timon, Parmenas, and Nicolas, you won't read anything more about them-- A proselite from Antioch whom they set before the apostles. And when they prayed, they laid hands on them, point of contact, recognition. "Then the word of God spread." I love that description. "The word of God spread, and the number of the disciples multiplied. There's God at it again. He's been adding, subtracting, multiplying again. They multiplied greatly in Jerusalem. And a great many of the priests, the Jewish priests who served in the temple structure, were obedient to the faith. Now, something to make a note of with those names, all seven names are Greek names. So who was complaining? The Greeks, the Hellenists, the Greek-speaking, Septuagint-oriented, Gentile, country-oriented Jewish believers. So what a beautiful way and grace to solve a problem. The Greeks are complaining. All the ones in charge of the problem and distribution will be Greeks. Love that. It's like affirmative action, New Testament style. They set before the apostles. They laid hands on them, and they prayed. And the word of God spread, et cetera, et cetera. Now, verse 7, I just want you to notice it because there's a mark. There should be-- you might even put a little pencil mark between verse 7 and 8 because verse 7 ends one section of the book of Acts. Verse 8 begins a whole other section. Verse 7 is a summary statement given by Dr. Luke, the author of this book, which he gives throughout this book when he wants to sum up or conclude or give you some kind of a field report on what God has done. He gives a summary statement and then moves on to another section and another section. So in chapter 2 verse 47, praising God and having favor with all the people, and the Lord added daily to the church, those who were being saved. That's a summary statement. Then there's a whole other section, and it's ended by this summary statement. There will be another one in chapter 9, another one in chapter 12, another one in chapter 16. God does a work. He sums it up neatly in one little principal form. And that's what verse 7 is. Now, verse 7 ends the witness of the gospel in Jerusalem, not for good, not historically, but primarily. Remember the outline of the book. Chapter 1 verse 8, you will be witnesses to me in Jerusalem, Judea, Samaria, and the uttermost parts of the earth. We have seen the witness in Jerusalem in these chapters. Now there is a shift, and the gospel's going to go out throughout Judea, Samaria, and then to the uttermost parts of the earth. So the next three events are those introductory events. What three events? The first martyr, Stephen, will be killed. Saul of Tarsus will be there witnessing it because they lay his clothes at his feet and he's observing it. Philip goes and spreads the gospel to Gaza and to Caesarea. Then Saul of Tarsus gets saved in chapter 9, and that becomes the catalyst to bring the gospel outside of Judea, Samaria, and he'll take it to the uttermost parts of the earth. So Luke is following his outline. Chapter 7, see it as a summary statement. Or verse 7 of chapter 6 is the summary statement. Verse 8 begins this. And Stephen, full of faith and power, did great wonders and signs among the people. Then there arose some from what is called the Synagogue of the Freed Men, Cyreneans, Alexandrians and those from Cilicia and Asia disputing with Stephen. We know that in Jerusalem, there was one big central place of worship known as the Temple. Temple structure, sacrifices were done there. Priests worked there. Enormous amount of activity was there. But not only that, but because of the captivity in Babylon, there developed the institution known as the synagogue. You never read about synagogues in the Old Testament. Suddenly they appear in the New Testament. That's because they develop between the Old and the New Testament in captivity. By the time we get to the New Testament, they're everywhere. Jesus in Capernaum went into the synagogue. He went into the synagogue and all the cities around Galilee. The Talmud tells us-- the Jewish writings tell us that at this time, there were 390 synagogues in Jerusalem alone. So think of the synagogue back then as sort of like churches today. Each synagogue had its own flavor, its own kind of emphasis, own style of people that were from different parts. And they just sort of got along and saw things that way, their own little cliques, their own little groups. You know how people do that today? It's like, I don't like church because my friend goes to this church. I'm going to that-- all of that happened in the synagogue, 390 of them in Jerusalem. The Synagogue of the Freed Men was the synagogue comprised of ex-slaves, freed slaves, or the family members of freed slaves, hence, freed men. We know that Pompey, the general of the Romans, took an enormous amount of different people from North Africa and Asia Minor as his personal slaves in the city of Rome. They eventually were freed in Rome, and a lot of them, who were Jewish, made their way here back to Jerusalem. They established a synagogue. Again, you're told where they come from, North Africa, Cyrene, Alexandria, Egypt, and also from Cilicia. Now, who comes from Cilicia? Saul of Tarsus. Tarsus was a city in the province of Cilicia. So no doubt, here is a synagogue that Saul of Tarsus, AKA Paul the Apostle, that was his synagogue. Even though he wasn't a freed man or the relative of a freed man, because he will say, I was actually born a Roman citizen, free-born, nonetheless because of the family ties to Cilicia, this was probably the synagogue he went to. So he's going to be there that whole time Stephen is he going to give his message in the next chapter. I'm just setting you up for that. And verse 10, "they were not able to resist the wisdom and the spirit by which he spoke." Again, he's filled with the Holy Spirit. That was one of the conditions to be a deacon in the early church. That's what these men were, servants, deacons. They couldn't resist the wisdom by which he spoke. Then they secretly induced men to say-- so they fabricated a story-- we have heard him speak blasphemous words against Moses and God. And they stirred up the people, the elders, and all the scribes, and they came upon him. And they seized him, and they brought him to the council. They also set up false witnesses who said, this man does not cease to speak blasphemous words against this holy place and the law. Does this sound familiar? Does this not sound an awful lot like the trial of Jesus before the Sanhedrin when they made up stories and because Jesus had made this statement when he said, destroy this temple, and in three days, I will raise it up again, speaking of the temple of his body. They misinterpreted that on purpose to mean, I'm going to destroy the temple. So they came up with a threefold fabrication. He's speaking blasphemous words against God, blasphemous words against Moses or the law of Moses, and blasphemous words against the temple. That's what it says here, this place. 4 verse 14, "we have heard him say that Jesus of Nazareth will destroy this place and change the customs which Moses delivered to us." That's the accusation. Now, that's going to set you up for chapter 7, because after hearing the accusation, the high priest in verse 1 of chapter 7 will say, are these things so? That's all the opener he needed. He now launches into a-- well, there's 59 verses after verse 1 in the next chapter. He goes into this incredible historical witness to share the gospel based on Jewish history to that nation in Jerusalem. Some people say, well, I'm waiting for an open door. I want to share my faith, but I haven't seen it-- the Lord has opened the door. This dude would take a crack in the window. Are these things so? That's all I need. Voom, and he goes with it. But look at the last verse of chapter 6, verse 15 "And all who sat in the council looking steadfastly at him saw his face as the face of an angel." You know why that's noteworthy? Because they said Stephen is speaking against not only God, not only the temple, but against whom? Moses. When Moses came down from Mount Sinai having received the law covenant of God coming down to the people after having intimate concourse, communication with God, he comes down. And the Bible says, his face shone brightly. I mean, these Jewish leaders should have looked at Stephen and thought, oh my word. This is just like what we read about happened to Moses. It's happening to this guy, because that would show them he's not against Moses. He's like Moses. This dude is shining brightly like Moses was when he had that intimate contact with God, the face of an angel. All the high priest can say, are these things so. And it's an incredible message that he gives, the longest one in the book of Acts. But we're out of time, so we have to wait until next week to look at it, and we will. But as we close our bibles, we open our hearts. And the band's going to come. I'm going to end this in prayer. And we're going to give you the opportunity to get up, find the nearest table near you, take the Lord's Supper right here in the front or go back to your seat if you wish. But take it with a friend. And maybe you don't know the person you're sitting next to. Get to know them. But just in the next 12 minutes, 13 minutes, let's take the Lord's Supper together and come to the table, the table of commemoration, the table of celebration, as we take together. Heavenly Father, thank you for the example of how the first church dealt with an issue of growth, an issue of conflict, and how in grace they came up with the right kind of organization that pleased the whole multitude, and the word of God spread. Lord, we thank you for the power of your word. We thank you for the power of the gospel truth. We thank you for the church, because we realize the only institution, the only entity Jesus promised to bless, was the church. He said, upon this rock, I will build my church, and the gates of Hades will not prevail against it. Thank you for that promise, Lord. We're just one little expression in this great, big town. We pray, Father, that as we gather together at the Lord's Supper, we pray, Lord, that as we contemplate and as we celebrate that we would honor you and do this in remembrance of you, but also looking forward to the time when you're going to come back. We do celebrate the Lord's death until he come. Thank you, Lord, that these elements speak of a work that we didn't do, but a work, Lord, that has been done for us, and a work that we enjoy the benefits of. In Jesus' name, amen. For more resources from Calvary Albuquerque and Skip Heitzig, visit calvaryabq.org. After Jesus rose from the grave, He spent forty days with His disciples before ascending into heaven. During this time, He tasked them with spreading the gospel to the ends of the world. In this message, we learn about the very beginnings of the early church. Saul of Tarsus (later called Paul the apostle) had an amazing impact on the early church. But what many fail to realize is that it didn't happen overnight. In this message, we learn what Saul did right after his conversion, and we see how God prepared him for ministry. Many in the early church had a hard time believing God's grace extended to the Gentiles. In this message, we learn how God used a Roman centurion to reveal to Peter that no one is beyond the reach of God and there is no place for bigotry among His people. We all need some encouragement from time to time as we grow in our walk with the Lord. Barnabas had the gift of encouraging those around him. In this message, we see how he encouraged Saul, who would later become Paul the apostle, to begin in his ministry. The Herodian dynasty was filled with proud, dysfunctional, evil kings. Herod Agrippa I persecuted the early church, killing James and imprisoning Peter. In this message, we learn about the power of prayer and see how God's sovereignty triumphs over the pride of man. God is a missionary God. Even back in the Old Testament, He often sent people out to do various things. Much of the book of Acts details how members of the early church were sent out to spread the gospel. In this message, we learn how Paul and his team set out on their first missionary journey. Paul and Barnabas had a specific format to their missionary work: they preached first to the Jews and then to the Gentiles. In this message, we examine Paul's first recorded sermon and the response it received. We learn the importance of being anchored in Scripture and centered on God's promises when sharing the gospel with others. All people disagree with one another at some point--even Christians. In the early church, a disagreement arose concerning whether the Gentile believers should be required to adhere to the Law of Moses. In this message, we learn how the early church found a biblical solution to this divisive subject. The apostle Paul continued traveling through Greece into Corinth, where he stayed eighteen months or so—the longest stay of all his missionary journeys up to that point. Though it was difficult and Paul was discouraged, the Lord told Paul not to be silent, but to speak in order that many would be saved. God's plan for spreading the gospel forged ahead. At the end of Paul's second missionary journey, he traveled to Ephesus but could not stay, as he was headed to Jerusalem. But he promised to return to the city, which he did in his third missionary journey. Paul's three-year stay in Ephesus was fruitful: the entirety of Asia Minor heard the gospel, and his vision for spreading the gospel grew to include Jerusalem, Rome, and even Spain. In this message, we see Paul on his third and final missionary journey. He knew he needed to speak to the elders of the church of Ephesus but was in a hurry to get to Jerusalem for Pentecost, so he and the elders met in nearby Miletus. In his parting words to the elders, Paul gave great insight into the attributes of effective ministry. Despite multiple trustworthy warnings about impending hardship in Jerusalem, Paul graciously received the warnings as preparation and proceeded to Jerusalem. There are 29 additional messages in this series.